Get in the spirit for Chinese New Year (February 19) with this nail art step-by-step using Gelish’s new Chinese New Year collection. 1. 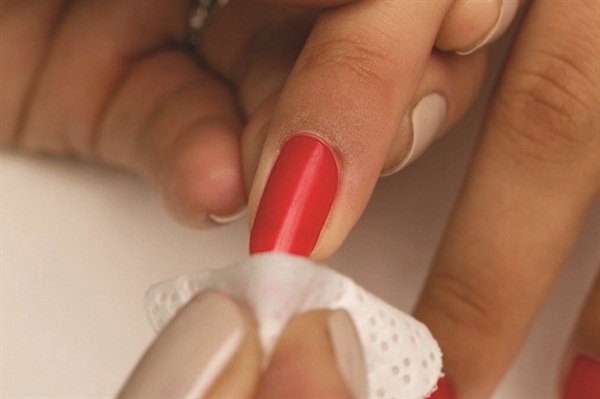 After removing the shine from the natural nail plate, apply Gelish Cleanser to a lint-free nail wipe. Apply Gelish pH Bond to the natural nail plate. 2. 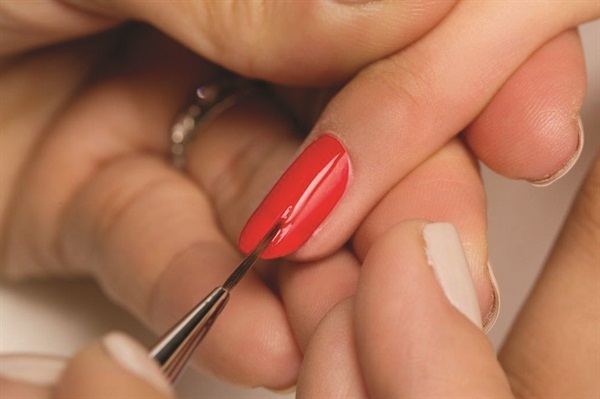 Apply a thin coat of Gelish Foundation from the cuticle to the free edge (remember to seal the edge of the nail). Cure the nails under the LED 18G light for five seconds or a UV light for one minute. Use a clean gel brush or a lint-free nail wipe to remove the excess Foundation on the nail plate. 3. Apply a thin coat of Gelish Soak Off Red-y for the Festival to the entire nail plate. Cure the nails under the LED 18G light for 30 seconds or under a UV light for two minutes. Repeat one more time for better coverage. 4. Apply a thin coat of Gelish Matte Top Coat to the entire nail. Don’t forget to cap the free edge. Cure the nails under the LED 18G light for 30 seconds or a UV light for two minutes. Use Gelish Nail Surface Cleanse to clean the nail. The matte finish will show on the nail bed. 5. Use the Gelish Striper brush and Gelish Top It Off Sealer to draw two horizontal lines side by side. Cure under the LED 18G for 30 seconds or under a UV light for two minutes. 6. Use the Gelish Mini Stripper brush to draw some decorative spiral circles in the middle of the two lines, then cure the nails under the LED 18G light for 30 seconds or a UV light for two minutes. Wait for 30 seconds, place the blue tint foil on top of the design then apply some pressure on the foil to transfer the foil to the design. Apply Gelish Top It Off Sealer to the entire nail then cure under the LED 18G light for 30 seconds or under a UV light for two minutes. 7. Remove the tacky residue on nails with Gelish Cleanser. Then, apply Gelish Nourish Cuticle Oil to rehydrate moisture into the cuticle and the skin surrounding the nail.